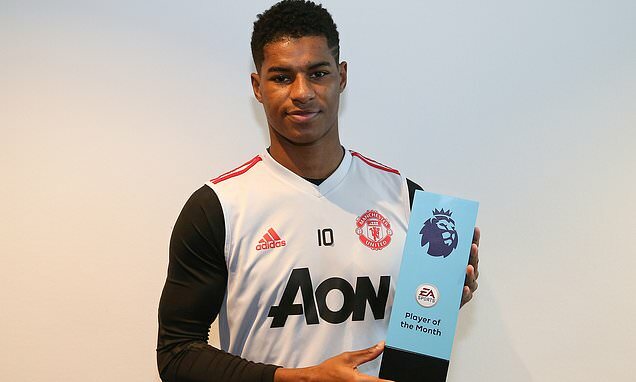 Man United winger Marcus Rashford won the Premier League player of the month award. This is a big achievement for the footballer and also deserved to get this title as he has an amazing season and proved his greatness one more time. England international became a key figure for the club after Jose Mourinho left the Red Devils and also scored several important goals last month. Real Madrid and PSG still interested to sign him and there will be a real battle for the footballer. His price could increase and become much more. Marcus is a product of Man United youth academy and spent his current career with them. He is one of the best forwards in Premier League and unchanged figure for the club. In this campaign, Rashford already played 30 matches, scored 10 goals and made 7 assists in all competition. This is an impressive result and he can improve his consequences during this season. The 21-year-old winger is contracted with the Red Devils until 2020 and his release clause is around €65m. He is a regular member of the national team and also helped them to finish the 2018 Mundial in a fourth place which is already a big success for the attacker. Los Blancos will do everything to add him during this summer as Cristiano Ronaldo moved to Juventus, Gareth Bale preparing to leave Madrid and their replacement is necessary. Man United signed several footballers last summer like Fred from Shakhtar Donetsk, Lee Grant from Stoke City, Diogo Dalot from Porto and improved the squad much more.